Designed and built by a Norman Foster trained architect and built to the highest specifications by the owner, this luxury villa with pool in north-east Corfu combines a strong Venetian influence complementing traditional Corfiot features with the ultimate in contemporary comfort. It offers privacy, luxurious accommodation and stunning pool areas with much sought after sea access. The location of Cassiopeia House is unrivalled. 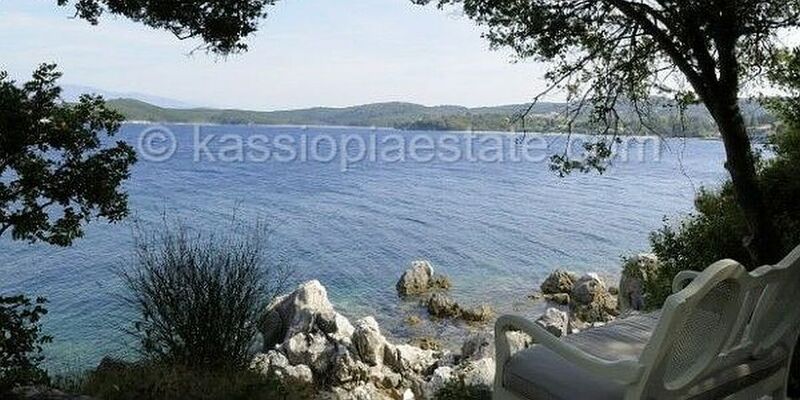 The house has its own vehicular access and is a 10-15 minute walk to the thriving little harbour of Kassiopi with its shops, bars and restaurants. Boat hire is a must, as from Cassiopeia House it is an easy trip to one of the many pretty waterside tavernas on the north-east coastline, stopping for a swim in another deserted cove along the way. The estate’s stunningly beautiful grounds incorporate woodland areas, beautiful rock formations and a host of indigenous trees, low shrubs, herbs, flora and fauna. A network of pathways and steps offers guests a magical tour of the estate, incorporating tranquil wooded areas, spectacular views and a number of perfectly placed seating areas along the way from which guests can relax and take in the scenery. The first sight, from the crest of the hill, of the seven bedroom Cassiopeia House is truly breathtaking. The sapphire coloured sea and theatrical and dramatic Albanian mountains provide the perfect backdrop for the intricate and elegantly tiled roofs and silhouette of this luxury villa with pool in north-east Corfu. As you pass through the archway and through a traditional Corfiot door you enter into an achingly beautiful courtyard, a magical world of your own where the frenetic modern world is left behind. There is direct access from the courtyard into the first master bedroom suite and adjoining guest room. The unashamedly romantic master bedroom suite has the stunning high vaulted wooden ceiling of a Venetian tower and access to is own private terrace with an impressive outdoor Jacuzzi. A ‘his and hers’ dressing area, walk-in shower, Jacuzzi bath and extremely comfortable super king size Jensen bed with enormous headboard add to the sumptuous luxury of the room. A viewing gallery with telescope allows for 360 degree views of the Corfu Channel, Albania and the Corfiot landscape. From the courtyard you glimpse the stunning sea views beyond Cassiopeia’s magnificent 16m sitting room with sunlight streaming through the nine French windows opening onto a breathtaking terrace with spectacular mountain and sea views. This serene and glamorous sitting room has stone floors and two beautiful open Corfiot fireplaces at either end. Furnished with comfortable sofas and chairs and internationally sourced fabrics, art and artefacts it provides the perfect balance of elegance and comfort at one end of the room, with a dining table seating 14 allowing for indoor entertaining at the other end, for cooler evenings. The terrace provides a perfect place to relax and to entertain. Its spectacular wrap-around views of the sea are quite breathtaking and the views towards the bays and inlets of Avlaki and to the rocky Island and lighthouse of Kaparelli in the south and up to the Kassiopi headland and Albanian mountains in the north are unrivalled. Cassiopeia’s well-equipped and state of the art kitchen opens out onto a fabulous outdoor covered entertaining area with its own bar, barbecue and outside dining table for up to 20 guests. Stairs from the sitting room lead down to five spacious bedrooms and bathrooms with their huge walk-in showers and marble surfaces. Each bedroom has been exquisitely interior designed and decorated with their own subtle themes and all have their own private terraces shaded by magnificent hand crafted stone arches and beautiful sea views, a perfect spot to relax in peace. 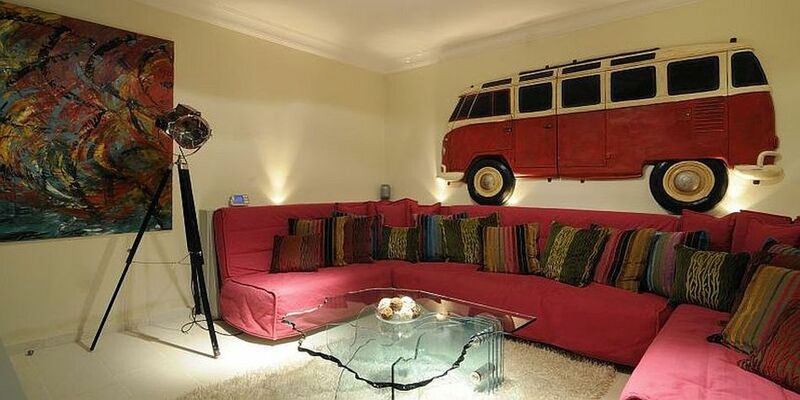 A fabulously funky retro cinema room with three huge “Hollywood Pink” sofas, a massive 52 inch TV screen and a VW camper van adorning the wall, is always a huge hit with the guests of Cassiopeia. A small gym plus a sauna and steam room complete the ground floor. The huge pool house and area is simply stunning. There is a 20m salt water infinity pool which merges seamlessly with the blue of the sky and sea. The poolside ‘Moroccan area’ with comfortable seating and striking stripey cushions provides the perfect shaded reading and relaxation area whilst the elegant pool house has a Corfiot fireplace, barbecue and small kitchen equipped with fridge, dishwasher, icemaker and all the poolside essentials. For a change of scene, hand crafted stone steps lead up to a second smaller pool overlooking the main infinity pool and area below. Designed with smaller children and parents in mind, the oval pool is easily viewed from the fabulously comfortable poolside day beds and sun loungers. From here steps weave their way down to a small pebble beach offering beautiful sea swimming and snorkelling from this luxury villa with pool in north-east Corfu. First Master Tower bedroom with Jensen super king size bed and 42” TV. En-suite bathroom with walk in shower and jacuzzi corner bath. Terrace (leading to the outdoor Jacuzzi for 9 persons). The Courtyard bedroom - Twin bedded room with en-suite shower room. Terrace. Large sitting room with dining area, table for 14 guests, leading to an enormous terrace and outside dining and entertaining areas. Outside dining / BBQ and bar area off the sitting room and kitchen. Outside table for 14 or 20 guests. Drinks fridges / ice machines. Double bedroom with super king size bed and en-suite shower room. Covered terrace (shared with other bedrooms). Second Master bedroom with four poster super king size bed. Private terrace. Twin bedded room (can't be converted into a double) with covered terrace (shared with other bedrooms). Study area with desk, sofa, TV and dressing area. Bathroom with extra large walk in shower and bath. Cinema room – 52” TV and B&W speakers. Gym – treadmill, cross trainer and multi-gym. Sauna, steam room and massage table. Air conditioning / ceiling fans in all bedrooms, study, kitchen, dining room and sitting room. Two dishwashers / microwave / coffee machine / three fridges / ice machines. Sky TV in the cinema room. Satellite TV – 200+ channels, including movies, in all bedrooms, study and the gym. Interchangeable twin beds using zippable padded top mattresses to create double beds in two out of the four twin bedrooms. Running machine, cross trainer and multi-gym. Pool table, table football, table tennis table and darts board in the courtyard. Swim jet exercise machine in the main swimming pool. Surround sound cinema room with 52” TV and five B&W speakers. Plasma screen TVs with 250 satellite TV and Radio channels, including movies, in all bedrooms, the study and the gym. Sonos music system in 9 zones including the sitting room, Tower master bedroom, pool area and outdoor terrace. Computer, fax, printer and Wi-fi connection in the ground floor study. 20m x 9m (1.8m deep) salt-water infinity pool with sunken day seats and corner viewing seats. Oval shaped salt-water children’s pool with stone water feature. From the pool area, access to the sea and a small pebble beach – accessed by narrow steps. Swimming areas from the beach, the rocks and jetty. Fishing off the rocks and jetty. Jetty (shared with Atolikos House). Changing room with power shower and restroom. Shaded and covered seating areas. Concierge - responsible for the day to day needs of the guests. The concierge is not resident but will come to Cassiopeia House when required and is contactable six days per week. Housekeeper - responsible for the day to day cleaning and running of the domestic side of the house and supervising the second maid as required – up to 32 hours per week over six days per week. The chef and the chef’s assistant - Included in the rental for July and August is a chef and a chef’s assistant who will both work from Cassiopeia House six days a week. The chef is responsible for all cooking requirements (breakfast, lunch and dinner) for six days per week. This includes shopping for food and drink (to a budget if required), serving, clearing up and BBQs, as required. The assistant will assist in the food preparation, lay / clear tables and help serve (if required). During other periods of the season (outside July and August) a cook may be arranged on booking, subject to availability and at extra cost. Additional maid service. When both properties are taken together, an additional maid service will be provided, six days a week. Jacuzzi hot tub, sauna and steam room – no extra charges for usage. All inclusive Golf packages (50% discount on all Green fees) are exclusively available to all clients staying at The Kassiopia Estate.